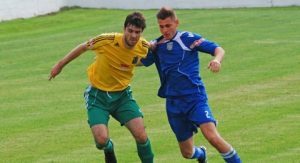 Frickley Athletic Football Club is in South Elmsall, West Yorkshire, England. 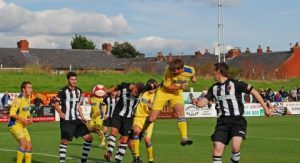 The club is a member of the Northern Premier League Premier Division. The club, commonly referred to as The Blues, was formed in 1910. It had been active since 1908 as a member of the South Yorkshire League. I that year, a local paper referred to the team as Frickley Colliery Athletic. 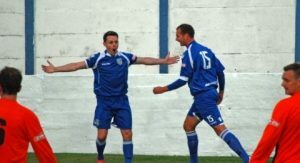 However, the name changed later on to Frickley Athletic. They participated in their first FA Cup as a member of the Sheffield Association League and they lost to Rotherham. They went back to the South Yorkshire League during the First World War but were back to the Association League in 1919. They improved steadily and in 1921, the club was crowned the champion of the league. 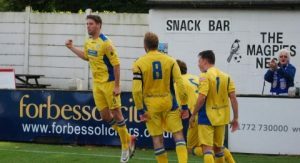 One year later, they lost the title to Gainsborough Trinity. However, they reached the fourth Qualifying Round of the FA Cup. In 1922, they joined the Yorkshire League. In a short time, the football club managed to make a good name for itself. They became one of the best teams in the league. They performed well in matches and in 1924, they were admitted as members of the Midland League following an application. They did not do well in the league as the competition was tough. In 1931, they were bottom of the league. It did not come as a surprise since they had conceded 137 goals. They withdrew from the league in 1933 and took a break for a year. When they came ac in 1934, their improvement was only slight. They finished bottom of the league again in 1936-1937. They, however, got to the first round of the first round of the FA Cup. Even though they lost to Southport, it was a significant achievement for the team. During the Second World War, the football club played in the Sheffield Association League until 1945 when they went back to the Midland League. They lost o South Shields in their second appearance in the FA Cup which was in 1957-1958. They entered the FA Trophy in 1969. Frickley joined the Cheshire League but returned to the Midland League in 1970. The performance of the team quickly improved. By 1970, Frickley was one of the strongest teams in the Midland League. They joined the Northern Premier League in 1976. At first, they lost plenty of matches and finished almost last in the inaugural campaign. However, the team improved steadily. In 1980, it finished third. In the 980-1981 season, the team landed a spot in the Alliance Premier ague (APL) which is the highest level next to the Football League. The club did well in that league. They reached the FA cup from 1983 to the next three years. Their most recent appearance in the FA Cup was in 2000. Since 1910, the club has been playing at Westfield Lane. That ground was used for athletics since 1904. It wasn’t until 1927 that the main stand was approved for construction. It was opened in 1929. The honors of the club include the Sheffield and Hallamshire Senior Cup and Midland League Cup. They won the latter in 1975-1976. They won the Sheffield and Hallamshire Senior Cup in 1927-28, 1956-57, 1960-61, 1962-63, 1966-67, 1978-79, 1985-86, 1987-88, 1989-90, 1999-2000, 2003-2004, 2013-2013, and 2014-2015. In 1985-1986, they won the Best League Performance in the second Alliance Premier League. In the same period, they won the Best FA Cup performance. Their squad features some talented players including John Stancliffe, Ben Algar, Liam Carrick, Jamie McGuire, Hugo Warhust, and more. The manager is Spencer Fearn and his assistant is John Stancliffe.